A life-long artist, he created a monument to honor the US Airmen killed in WWII. It was fitting that he passed away on May 28th, 2018… Memorial Day. Fredric Arnold, the last P-38 combat fighter pilot of his Class of 42-J Group died at 96, but not before finishing the most ambitious and meaningful work of his life. Arnold devoted his life to helping people appreciate the incalculable human cost of war. A life-long artist, he created a monument to honor the US Airmen killed in WWII. It was fitting that he passed away on May 28th, 2018… Memorial Day. Only Arnold and one other pilot of their original group of 14 pilots survived combat. The two remained close following the war. They vowed the “last one standing would do something to honor” their fallen buddies. Arnold fulfilled that vow 70 years later. His monumental sculpture, “Lest We Forget: The Mission”, now on display at the Wings Over the Rockies Air and Space Museum in Denver, honors the more than 88,000 US Airmen killed during the war. Arnold completed the seven-year project at the age of 94. A life-long artist, Arnold appreciated beauty wherever he found it. He had no desire to go to war, but answered the call when the need arose. The horrors of the war scarred him deeply and he vowed to honor the twelve out of fourteen of his original Group and the countless others killed in war. He created the monumental bronze sculpture of twelve airmen in a mission briefing to depict what he called the “quiet heroism of deciding to go on yet another mission, knowing it was Russian Roulette and that some would not return”. Dr. Nick Mueller, former CEO, National WWII Museum wrote, “Fredric Arnold had a full life of service to his country, to his art and to his creative genius. He was a great man. We all feel privileged to have known him here at the National WWII Museum”. Arnold survived 50 combat missions in North Africa, ending his tour as squadron leader. He was the recipient of numerous medals, including the Distinguished Flying Cross and the Air Medal with Nine Oak Leaf Clusters. Following combat, he was assigned to the Office of Flying Safety and, in that capacity, wrote and illustrated the first official flight manuals for the P-38, P-51, P-47 and XP-80. He was promoted to the rank of Major at the young age of 23. Following the war, he led a full and varied life as an inventor (creator of the aluminum folding chair), businessman (several successful companies), actor (appearing in more than 20 movies), writer (best-selling autobiographical novel: “Doorknob Five Two”), public speaker (lecturing to hundreds of groups) and prolific artist (in varied media ranging from sand sculptures to fine art). 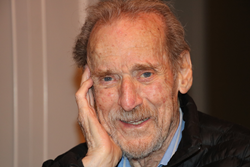 Fredric Arnold (formerly Fredric Kohn) is survived by his loving wife, Natalie, of 73 years, his three children, Marcie, Dana and Marc, his five grandchildren and a circle of friends and supporters that span the globe. Arnold was buried in a traditional Jewish service in Boulder, Colorado. Those who wish to honor his memory are invited to visit http://www.LestWeForgetSculpture.org, take a moment of your day to appreciate the debt we owe to the countless young airmen of WWII. Arrangements are in place to relocate the sculpture to the National WWII Museum in New Orleans. Arnold dreamed of seeing two of his sculptures exhibited to the public, one in Denver, the other in New Orleans. If you are moved to do so, you may make a contribution through the website to help fund a second casting of the sculpture.